When it comes to conspiracy theories, few can beat the truly bizarre ideas of David Icke. His theory of "reptile overlords" disguised as humans and controlling the world, is way out there. Who knows? He may be right about reptilian demons wearing fake human skin and controlling the world, or he may have been a big sci fi fan who loved "V" - a TV show which featured reptile aliens disguised as humans with evil plans for mankind. Oddly similar, eh David? But anyway…. Whatever the truth, one thing was for certain: I just had to create a shoot based on this weird theme. I love the old TV show "V", although I'm not such a huge fan of Icke's theory (to each their own). The idea of well-dressed attractive women revealing green reptilian skin below their fake human skin was just too good not to do! I knew going in that this shoot would need some major Photoshop work. 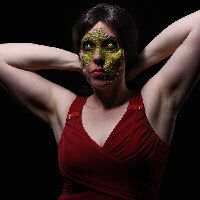 The makeup was done with economy in mind, incorporating a built-up edge of ripped skin revealing the scales of the reptile. The green reptile skin was made fairly basic in the studio with the intention being to embellish it digitally afterwards. The makeup was actually created, and Photoshop was only used to enhance, rather than actually create the reptilian element. Claire wore contacts whereas Krissy chose not to, so her eyes were digitally altered. I didn't want to lose the girls' natural beauty in this shoot. After all, the human disguises had to pass for real, so when part of the fake face was removed, what's left had to still look attractive. This meant handling the horror makeup with great care, and avoiding the temptation to splatter a heap of gore onto their faces. For me, this was an exercise in restraint, as I love to cover people in blood and gore. It made sense in the narrative of the images to avoid gore too. The faces were fake, and would't bleed if ripped. 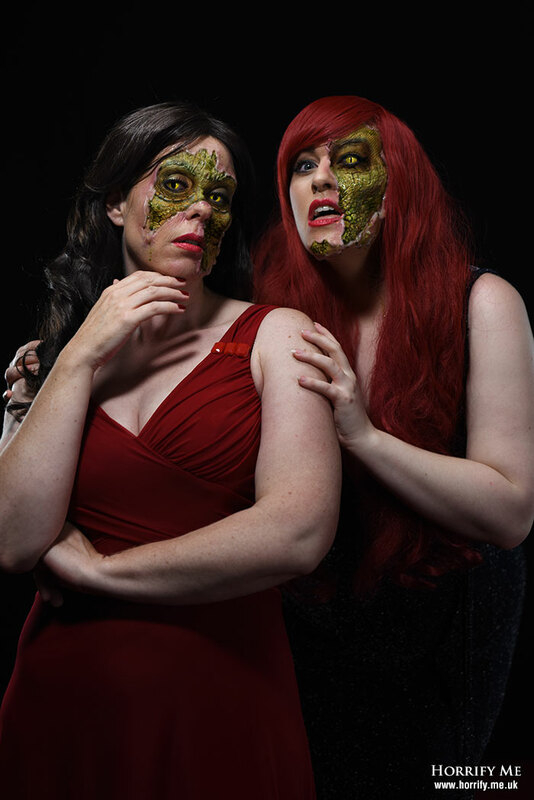 I did allow myself a little bit of green ooze, which I justified as some form of "alien reptile lubricant" to allow the lizard girls to wear their human faces for longer, but in reality it simply gave me an excuse to apply just a little bit of gross stuff. It's most obvious in the angry shots that show the reptiles in full "grrr" mode. Set against the pale skin of the models, the green scales pop nicely from the photos. The crafted depth of the torn skin really sells the illusion. Without this, the effect would have been far weaker. No matter how good the Photoshop work is, nothing beats the real thing and I knew that this built-up torn edge was the most essential aspect of the makeup which is why I spent most of the makeup time creating these parts. 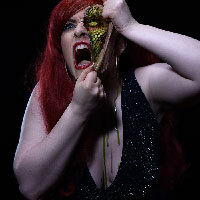 The image of Krissy tugging the skin from her face was achieved with a small flat piece of latex which she simply stretched in her hand against her face. It looks very effective but was ludicrously simple to do. 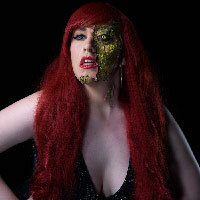 I called this shoot "V Girls", named after the TV show, but I cannot help thinking how weirdly cool it would be if David Icke's reptile overlords actually looked like this.